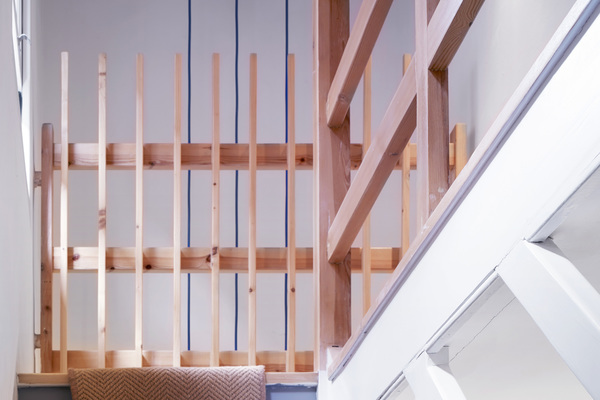 A contemporary & sustainable conversion of found space at the top of an early Victorian vicarage achieved by way of a tall private stair leading up to newly ordered and opened contemplative attic space. The scheme added a new stair flight to enjoy a triple height sole stair access. 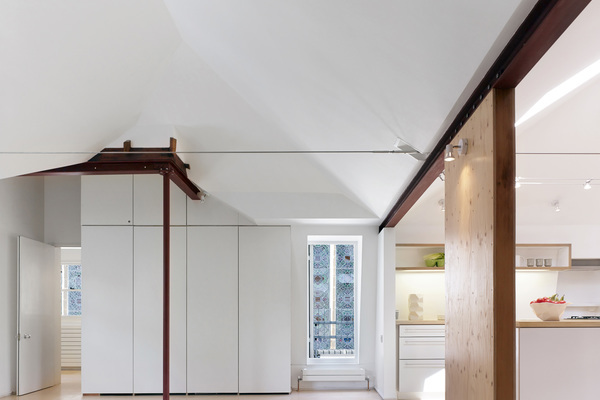 We converted the vicarage old garret newly into a residential in the community flat. 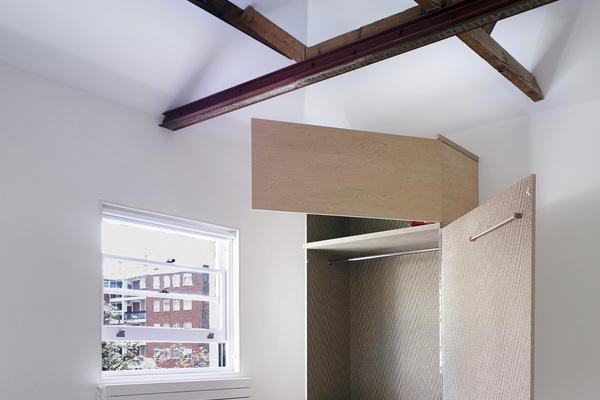 The approach requested was to explore a contemporary and sustainable conversion of seemingly moribund spaces at the top of an early Victorian vicarage. The parishioners wanted a legible and open figure to the construction, and a sociable neighbourliness. The original roof floor had decrepit introverted small divided rooms. The roof had collapsed a foot downwards. The brief was to find a sense of space and make a simple layout. We extended a new separated staircase up to make an own street door and stair. The builder inched the roof upwards with acrows to its previous considerably higher shape. 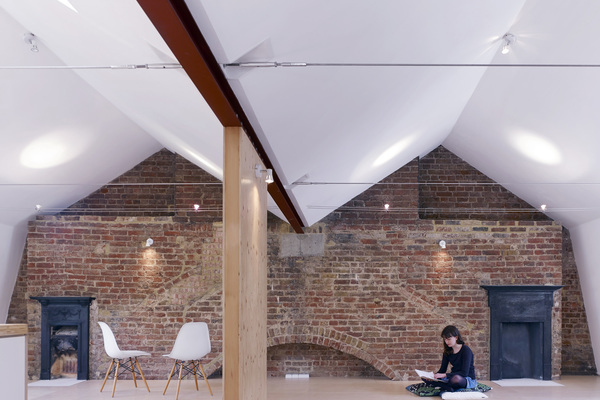 Interior walls and drop ceilings were stripped out, exposing antique brickwork and roof void. A new acoustic floor sealed bare delivers an increase in area, with exposed /\/\ shaped roof spaces that take advantage of the building form. The solution successfully achieved this with the introduction of a single volume, largely open plan space incorporating double height ceilings for different uses such as kitchen-dining, living room, storage, and working area. We sought to maximise the space and reveal its three dimensions in character to provide an inspiring living environment. 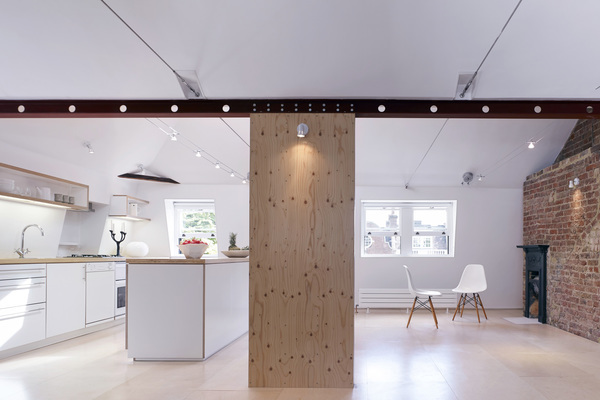 Flexibility and clarity of interior construction is attempted through a generally pervasively visible timber construction. Insulation specified and constructed in the conversion was to very high standards. Renewable sustainable timber is the only constructive building material along with steel, other materials being glass, silicone, insulation and then the fittings. We specified sustainable (fsc) ply spruce sheets, and birch, all fsc certified. Full-uncut sheets were used for minimum wastage. The tall cupboards are close to 8 feet expressing sheet size. To minimise energy use we have incorporated high levels of insulation throughout, with air-tightness. All walls have 60mm thick Gyproc ThermaLine SUPER plasterboard, which provides a thermal insulation U value 0.25. The roof has further insulation in the interstices co-achieving less than .2 U value. All new windows are double glazed with high performance glass. Specified as two panes of 6mm toughened Optitherm glass, and a 16mm argon filled cavity, this delivering a U value of just less than 0.9, which is approximately 50% better than narrow space double glazing in heat loss terms. We added a floating sandwiched layer of greenboard and sound-absorbent sika acoustibond adhesed super-floor, in effect a double floating floor, offering good soundproofing.